Welcome to Willy Wabbit & His Magical Books Willy Wabbit is a fun-loving playmate who takes you on adventures through his magical books. Easy to use and follow along. Children of all ages will love the special sound effects and colorful animated stories while learning reading recognition and how to guide the mouse. 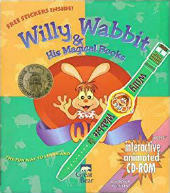 The story begins in 'Wabbit Land' and takes you into Willy's Treehouse, where Willy wants to read some stories with you. Go with Willy to the Zoo, the Playground, the Park, into Space, under the Sea, to famous landmarks and into the Music House. With a point and a click, the objects and characters in the program come magically alive! It's a perfect introduction to computers.